First: Go through the movements necessary to form "The Well." Second: Turn the palms toward you and slightly upward, and slacken a little the strings held down by the little fingers; then insert each little finger from below into the thumb loop, bend it over the near thumb string, and take the loop off the thumb (Fig. 190, Right hand), and hold it down together with the two lower strings of the figure. Separate the hands. The palms now face each other again, and the middle finger and the ring finger of each hand should be slipped out of the triangle close to the hand, and the three lower strings held down by the little finger alone (Fig. 190, Left hand). 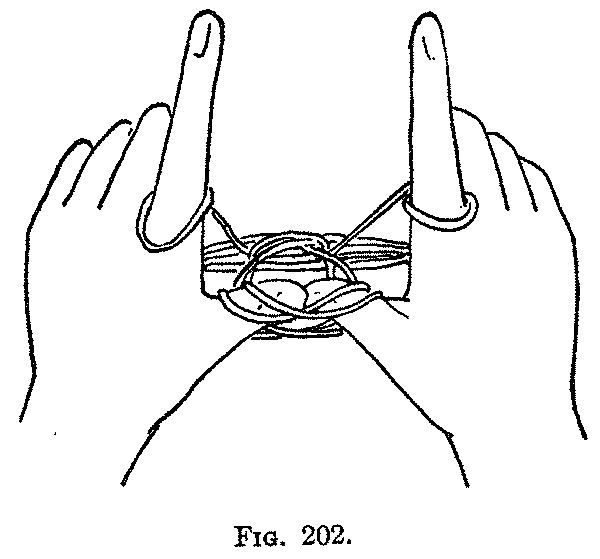 Third: Turn the palms away from you, and insert each thumb away from you into the little finger loop, then, turning the palms toward you, draw toward the palm with the bent thumb the diagonal string which runs upward from the little finger and serves to separate the two triangles near the hand. Now, still holding the string on the thumb, insert the thumb away from you behind the two strings running from the little finger to the far side of the index (Fig. 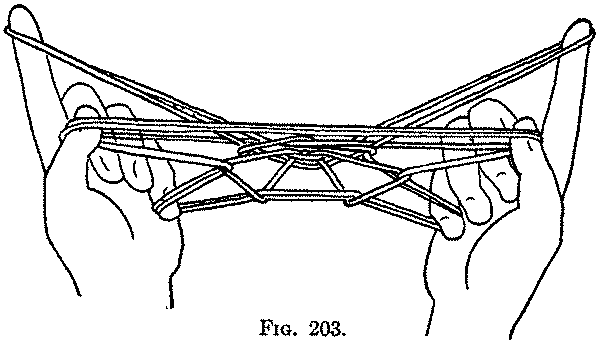 191, Right hand), and draw these strings toward you with the back of the thumb, withdrawing the little finger (Fig. 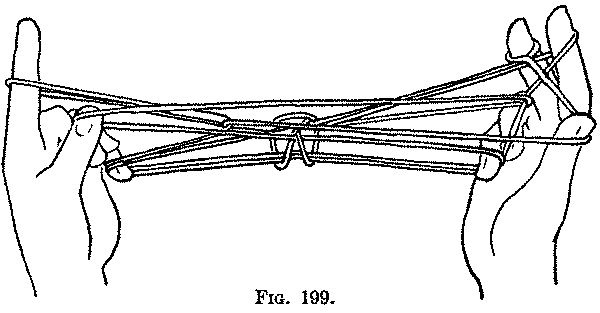 191, Left hand). Fourth: Turn the palms toward you, and insert each little finger toward you into the two thumb loops, and remove the thumb (Fig. 192). Fifth: Hold the loops well down with each little finger; pick up from below with the back of each thumb the near index string which runs directly from index to index and draw it toward you; remove each index from its loops (Fig. 193). Sixth: Insert each index toward you into the loop held by the thumb, and with the back of the index pick up the near thumb string; return the index to its position and remove the thumb. Seventh: Keep the index loop well up on the tip of the finger; pass each thumb away from you, and pick up on the back of the thumb, and draw toward you (Fig. 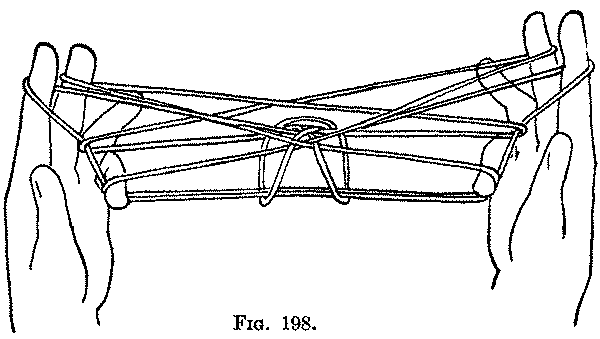 194) the horizontal string which holds the side lozenge of the central figure to the vertical string running from the little finger to the near side of the index. 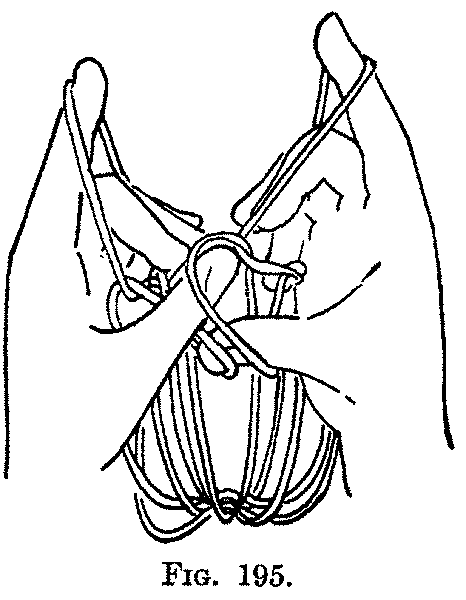 Eighth: Bend each middle finger toward you down over all the strings, and hold them down tightly while you exchange the loops on the thumbs, putting the right thumb loop from the right thumb entirely on the left thumb and the left thumb loop from the left thumb entirely on the right thumb (Fig. 195); being careful not to twist the loops or let the loops slip off the index fingers. Straighten the middle fingers and the index fingers, and separate the hands (Fig. 196). Ninth: Bend each middle finger toward you over the index loop, and bring it into the thumb loop from below; and take the loop off the thumb by lifting up the far thumb string (Fig. 197), returning the middle finger to its former position, and withdrawing the thumb (Fig. 198). 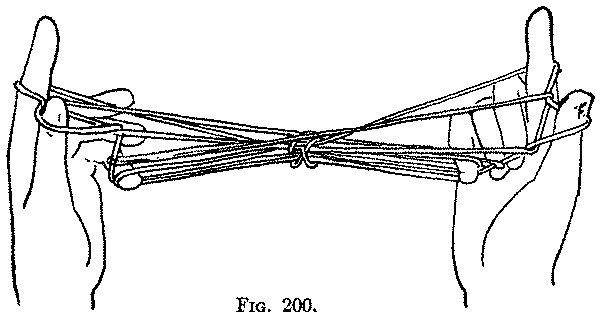 Turn the palms toward you, and bend down each middle finger, and with the back of the thumb, inserted into the middle finger loop from above, take up the far middle finger string, and thus turning the loop over, restore it to the thumb by putting the thumb again in its usual position (Fig. 199, Right hand) and withdrawing the middle finger (Fig. 199, Left hand). Tenth: Insert each thumb from below into the index loop, and with the back of the thumb catch the near index string and draw it down toward you through the thumb loop, and let the thumb loop slip off the thumb (Fig. 200). Release the loops from the index fingers and separate the hands. Eleventh: Transfer each thumb loop to the index, by putting the index into it from below, removing the thumb, and returning the index to its former position (Fig. 201). 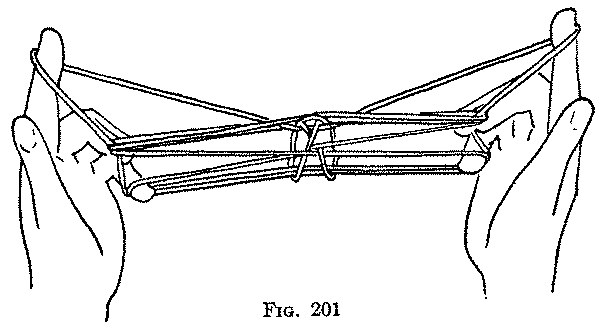 Twelfth: Holding carefully the loops on the index and little fingers, with the back of the thumbs pick up, within the small central triangle of the figure, the crossed strings which run from the little finger of one hand to the vertical string passing on the other hand from the little finger to the index (Fig. 202). Be careful to pick up these strings within the small triangle just where they cross, and in doing so keep the backs of the thumbs close together. 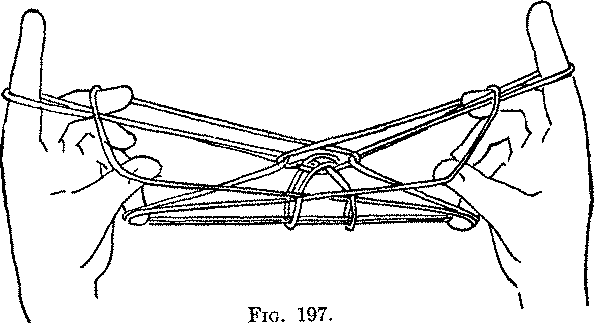 The hands are then separated and put in their usual positions (Fig. 203). 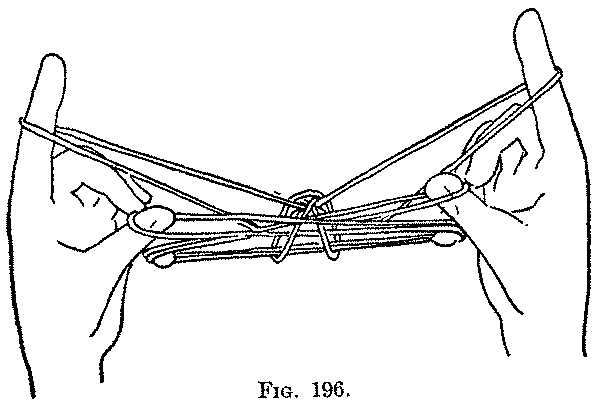 Thirteenth: Pass each thumb away from you into the index loop from below, and with the back of the thumb draw the near index string toward you (Fig. 204, Left hand), and completely through the two loops already on the thumb; then let these two loops slip entirely off the thumb (Fig. 204, Right hand). 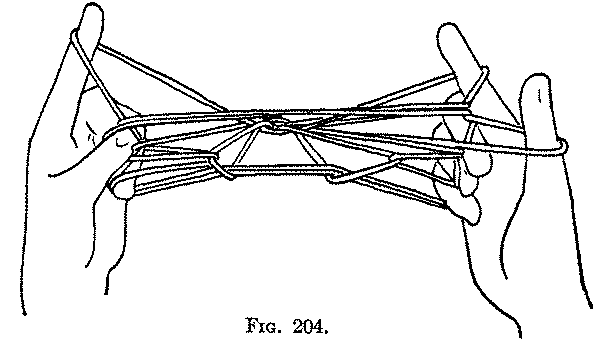 Fourteenth: Release the loops from the index fingers and draw the hands apart. Fifteenth: Transfer each thumb loop to the index finger, by inserting the index into it from below, between the thumb and the small ring which passes around the thumb loop, withdrawing the thumb, and returning the index to its former position. Extend the figure between the tips of the index fingers and the little fingers closed down on the palms (Fig. 205). 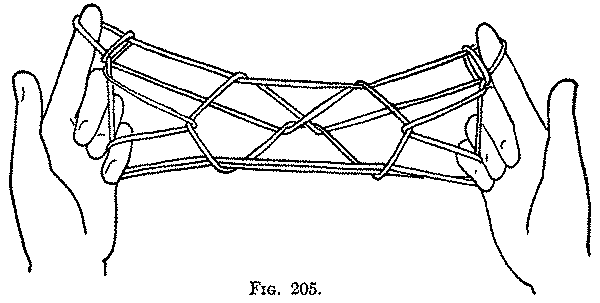 The two central lozenges represent the crab’s body, the lines radiating therefrom are the legs, and the "pincers" are the small rings passing around the index loops. T pu nFS: re 2bTN: re F, kl: tr TN to F, ex, arr. The crab is a long figure, but the movements are not diiiicult; although it is rather hard to remember the order in which they come. The finished pattern has a greater likeness to the object it is supposed to represent than some of the string figures.